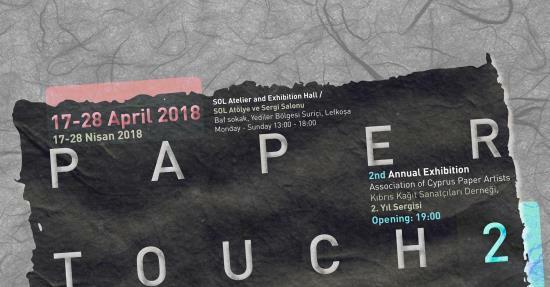 The second PAPER TOUCH Exhibition will take place this year at the charming SOL Atelier in the heart of Old Nicosia. The address: Baf Sokak, Yediler Bölgesi, Suriçi, Nicosia (not far from Lokmacı Crossing). Ahmet Albayrak - Arzu Altınkılıç - Aslı Bolayır - Berna Aydın - Emel Samioğlu - Eser Keçeci - Gökçe Keçeci – Hakan Pehlivan – Hana Altaratz – Heidi Trautmann – İnci Kansu – İsmet Tatar – Kemal Behcet Caymaz – Klein Hedva – Laura Behar – Mustafa Öztunç – Nilgün Güney – Nurith Eppstein – Nurtaç Özler – Omid Kalantar Motamedi – Roya Alaqhehand – Ruth Shomroni – Sefi Gal - Sevil Savgı – Simge Uygur – Ulviye Perçinci plus Sofia Hadjipapa talking about her work during an afternoon presentation. On April 24 at 15:00 hrs will be a workshop led by the artist Laura Behar ‘Painting with Pulp’. People interested in participating in the workshop, should please give their names to Facebook Messenger : Kağit Sanatcıları Dernek Üyeleri until April 04, or contact Ismet Tatar or me, Heidi Trautmann (Tel. 0533 876 7470) for further details. Costs for Non-members is Euro 25 or TL 125. In the whole of Cyprus paper making for the use of art was not an established discipline, only when in 1989 the artist Inci Kansu took over a pioneering role while searching for a more satisfying form of art. She was given a Fulbright scholarship for plastic arts in the USA and that is when she fell in love with paper and paper making. ‘The life cycle of paper is the same as of human beings, it is born, it lives, changes, dies and is reborn’. This became Inci Kansu’s philosophy and she discovered for herself a wide field of art activities. Three years later she became a member of IAPMA and profited immensely from participating in the many activities that were offered. She shared her excitement with her art friends and colleagues and recruited four of them, Ismet Tatar, Emel Samioğlu and Simge Uygur, to join in the adventure of discovering their own world in the wide field of paper making and paper art; their IAPMA membership followed, so now four pioneers went to participate in worldwide IAPMA encounters for workshops, lectures and exhibitions. The road, these four first pioneers of paper art followed, was from the very beginning a very individual one; Inci Kansu’s famous works took sometimes a decade to finish like her Cupper Tunnel Project or the Tulipa Cypria the theme of which recurred many times in varied forms: Ismet Tatar who has always been working on Cypriot heritage, combines her themes homeland and soil with paper art using paper made from native plants. Emel Samioğlu found exciting new ways on the basis of her family’s history of seamanship, repeating basic symbols in her art, the sea and the boat. And finally Simge Uygur who worked on matters of life, sculptures of bodies, female bodies, symbolism of emerging life in many forms. Having gathered constantly growing experience, the four pioneers set out to do joint and/or personal exhibitions in order to make this fascinating form of art - which goes back to the very basic origins of nature – known among their fellow artists on the island. They continued to travel to international paper art events to participate in conferences, workshops and exhibitions, they communicated and learnt. In the meantime paper art museums were opened around the world and could be viewed for many interested. For the 25th anniversary of IAPMA the four pioneers invited and organized a most unforgettable event in North Cyprus at the Near East University in April 2011 with workshops and exhibition and a fashion show on the programme. 19 artists have displayed their breathtaking work in the hall of the Communication Faculty: Helene Tschacher, (then President of IAPMA) Eva Maria Juras (today President of IAPMA), Joachim Tschacher, Kathrin Biffi, Ute Breitenberger, Johann Söhl, Anne Lise Studer, Jan Fairbairn Edwards, Nur Gökbulut, Nurtaç Özler, Yurdagül Pakalin, Hakan Pehlivan, Anne Räisänen, Bara Lehman-Schulz, Aliza Thomas plus our local artists Inci Kansu, Ismet Tatar, Emel Samioğlu and Simge Uygur. They came from all over Europe, individualists with their own cultural background and traditions, woven into their artwork and it was most interesting to hear the personal story and connection to the artform when they introduced themselves on stage. A fashion show created by the artists and some beautiful students of the design faculty gave us a further impression of the wide possibilities of the use of paper art. It was most obvious to me that the students had the fun of their life. In the short time of three days many students attended the workshops given by the artists in several rooms and on various subjects, and I could see the students develop objects which they have not thought possible before. The Vice Rector of the NEU, Dr. Şenol Bektaş and the Management Commitee, Prof.Dr. Orhan Çiftçi (Dean, Communication Faculty), Assist.Prof.Dr. Gökçe Keçeci Şekeroğlu (Head of the Visual Communication and Design Department), Mine Okur (Lecturer), Gamze Anıl Baykan (Lecturer) and many others helped to make the sojourn of the artists a pleasant one. They were also taken around the island to see the multi-layered culture and nature of Cyprus. After this event the philosophy of paper art became more widely known in the local art scene so that on 17 October 2015 a long expected dream became reality with the establishment of an own paper art association in North Cyprus. The number of artists joining increased rapidly, artists who in one or other form had worked with paper. In May 2016 the association had registered 21 members. Besides the many preparatory works regarding the infrastructure of the association the first year passed rapidly with organizing, instructing and advising by means of workshops, lectures and exhibitions. -Ismet Tatar gave a presentation to the members of the Inner Wheel Club of the Rotarians. -In May 2016, the association organized workshops and an exhibition with works of their members at the METU in Kalkanli in cooperation with Serhat Selişik, Dept. of Arts. On May 11, Inci Kansu held a seminar to an interested audience, mostly teachers and students, about paper as such, its beginnings and its journey from the East across the globe and finally about the history of the use of paper for the arts. During the following days Inci Kansu, Ismet Tatar and Emel Samioğlu have led separate workshops to teach the making of paper from recycled paper, the further use of the produced paper and how to make objects from paper pulp. The workshops met with high interest. -There was a further in 2016 with workshop and seminar at the Eastern Mediterranean University (EMU) in Famagusta. Finally there was the first anniversary in November 2016, with a retrospect on a fruitful first year. The members of the Association of Cyprus Paper Artists have done everything to make this event a big success, which it truly was, through to beginning of December. Threads of communication had been established to other artists of IAPMA celebrating its 30thanniversary and thus many postcards from its members around the world with artistic birthday wishes had come in and were attached to a traditional wishing tree in the middle of the hall, so very touching. This project was a gift from the IAPMA presidency, for which the association is deeply grateful. Kemal Behçet CAYMAZ, Mustafa HASTÜRK, Mustafa ÖZTUNÇ, Nilgün GÜNEY, Nur GÖKBULUT, Nurtaç ÖZLER, Özden SELENGE, Simge UYGUR, Sophia HADJIPAPA, Şükran TÜMER, Todor TODOROVA, Vedat ÇOLAK. The present year 2017 continued with similar activities, one of which was an invitation by an EU organization on the occasion of the International Green Week, to hold a workshop in their premises to show to an interested group of adults and children from the age of 6 years and teens. The workshop was about the making of objects using waste paper such as old newspaper in this case. The artists Inci Kansu and Ismet Tatar have led the workshop of three hours, there were 23 students present in the workshop. A home for the Association was finally found in 2017, the host is the Arabahmet Cultural Centre which is supported by the Girne American University. On the occasion of the General Election Meeting the programme for the coming season 2017/2018 was presented including some interesting highlights, workshops at local universities with the project of paper making for the purpose of printing; another workshop will show the sewing of paper, folding techniques, and also burning patterns into paper. Another project is to do EBRU art. There will also be workshops which will be led by guest artists, for example Laura Behar from Israel who will attend the association’s next anniversary. At the end of 2018 a great IAPMA Exhibition which is planned to tour in European countries will also come to the TRNC which will be a great experience for all artists on the island of Cyprus. The Association of Cyprus Paper Artists is deeply grateful to the former and present presidency of IAPMA for all their support and interest. They offered many opportunities to the Associations members to learn new ways and experience cooperation on a worldwide basis. The more members are joining the association, the more awareness on this nature conserving art form can be built up, and the more variations of the theme will develop.